I've always done the Color Blocking Technique with solid color card stock - but the new Candy Lane DSP works well too. 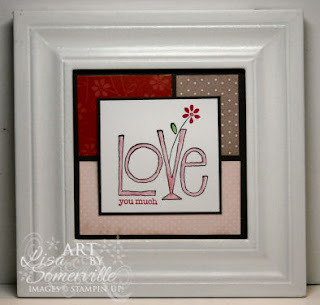 Here's I've used items from the Love You Much Bundle to create the Color Blocked Card and matching Framed Art piece. The frames are from an old dollar spot purchase at Target - gotta love 'em! 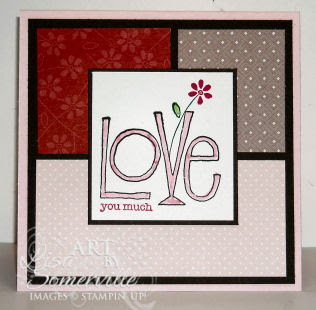 Click here to view more information on the Love You Much Bundle. Email me today to order your bundle and save 20%! These are great...I especially love it framed!!! Love the new look on the blog, too! Wow, this looks great in the frame! Happy New Year! Love it!!! I bought some of these too (4 x 4 size I think) and wish I would have bought more but am going back today so we'll see. Great job, love how it matches. Oh My GOSH!! This will look SO CUTE in my craft room!! !